Huntingburg, IN is a delightful place to visit for the weekend or even better, a place to permanently put down roots in! The city of Huntingburg is “A City Like No Other”, and offers tree-lined quiet neighborhoods, a quaint downtown with thriving local businesses, and community events throughout the year to keep everyone connected. Whether you own a home, business, or both in Huntingburg, you can trust the pest control experts at Action Pest Control to keep your residential or commercial property free of insects, rodents, and other critters. Our QualityPro certified team is ready to work with you to eliminate any annoying, dangerous, and damaging pests from your property and keep them out year-round. At Action Pest Control we have the experience, training, and industry-leading solutions needed to get rid of pest issues from any Huntingburg, IN home or business. Give us a call today to learn more about our trustworthy team and trustworthy pest control solutions! To protect your Huntingburg property from the barrage of pests that are trying to get inside of your home in order to gain easy access to food, water, and shelter; the professionals at Action Pest Control have developed 4 different options of comprehensive, highly effective pest control programs. The variety of programs that we offer allows each of our homeowners to choose the exact program that meets their exact needs and budget. If you are looking for a basic, highly affordable year-round pest control program turn to our Essential pest control program, it provides exterior pest defense services and cobweb removal. For a more inclusive service choose our Advanced pest control program, it provides our customers with both exterior pest defense and interior pest treatments. It also includes cobweb removal, window sill vacuuming, the placement of exterior rodent stations, rodent control services, as needed pest proofing, unlimited services calls, and services that are fully guaranteed! For even more pest protection, consider our Complete pest control program, it includes everything that is found in the above Advanced pest control program, but also includes an annual attic inspection, termite monitoring services, and a termite inspection. And finally, for the more comprehensive protection against pests in your home choose our Premier pest control program. It is our most inclusive program and provides the most protection from your home. This program includes a termite warranty and termite treatment in addition to providing all of the pest control services that are found in the Complete pest control program. Contact us today to speak with one of our professionals and learn more about which program is right for you and your home! Brown recluse spiders found living outside away from people are an asset; they hunt and feed on nuisance insects helping to keep their populations down. But, when these spiders decide to move inside of homes, garages, and sheds to live and hunt for food, they can become a problem for people, a big problem! Brown Recluse spiders are considered to be dangerous because a bite, while rare, can cause huge health consequences. The skin around a brown recluse bite ulcerates and can take a very long time to heal and is prone to infection. To help avoid these spiders, we first suggest making sure to keep clothing, bedding, and like items up off of the floor. Before putting on clothing and shoes it is always important to shake them out, hopefully dislodging any brown recluse spiders that are hiding inside. Keep clutter inside your home, garage, and sheds to a minimum, the more clutter the more places they have to hide unnoticed in. Remove piles of sticks, leaves, logs, and other debris from your property; store wood on pallets located at least 20 feet from your property. When doing yard work or moving boxes and items around in outbuildings always wear work gloves. Make sure that screens placed inside of windows and doors are completely intact, that any gaps around windows and doors are caulked and that door sweeps are placed underneath all exterior doors to help keep these spiders from gaining access inside of your home. If you are finding brown recluse spiders on your property contact Action Pest Control immediately. We can successfully eliminate these spiders through our brown recluse spider management program, give us a call to learn more! Let’s work together to ensure that your commercial property is not a place that pests are going to want to or be able to enter inside of! For more information about our commercial pest control services, get in touch with us today! Protecting your Huntingburg property from termites is a difficult task, these wood destroying insects are very elusive, they silently enter into your home, many times causing major damages to a property before their presence is even noticed. To help protect the structure of your home and the integrity of your bank account, from highly destructive termites, Action provides its customers with a five-step termite control system. 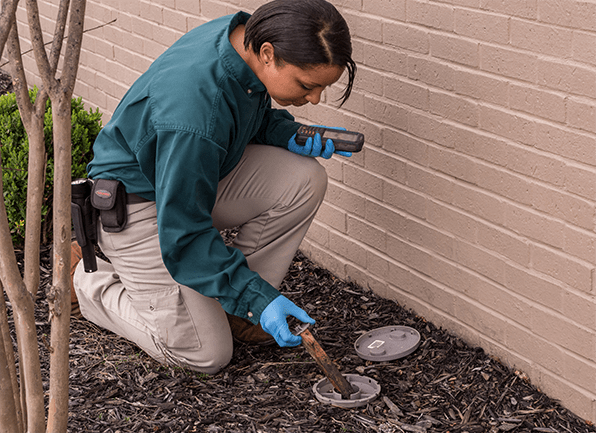 Our termite control system provides the comprehensive treatment that is needed to quickly detect a termite infestation and to eliminate the entire colony from your home and property. The first step begins with a comprehensive inspection that is performed by one of our licensed professionals. The second step is treatment to eliminate the infestation through the use of Termidor®, a highly effective product that gets rid of termites through both ingestion and direct contact. The third step is a three-month termite elimination inspection, our inspectors will return to ensure that the infestation is completely gone; the fourth step is an annual termite inspection to make sure that your home is remaining termite free. And finally, the fifth step is our money back guarantee and damage warranty! Don’t let termites take over your property and savings account, turn to Action Pest Control to eliminate termites from your property once and for all!